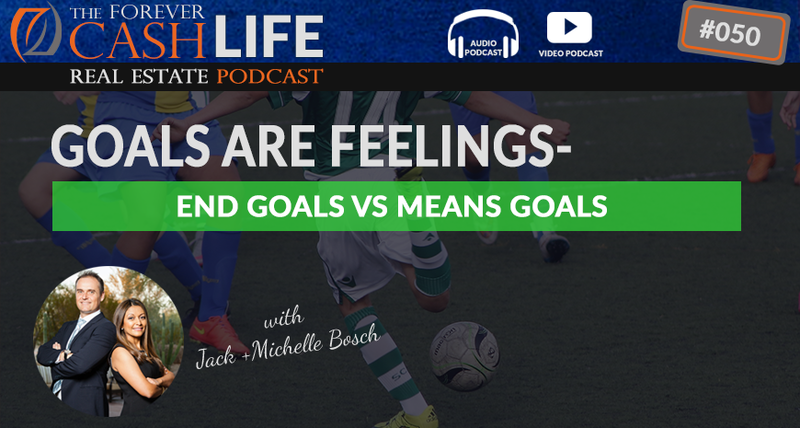 Okay, so, this time around, we thought that it would be great to talk about end goals versus means goals. So, here’s the here’s the deal, most people are focusing on a means goal. Nobody really is asking, “What do I want out of life? What’s the end goal that I want? How I want, what do I want my life to look like?” And more than anything, “How do I want to feel about that?”. Most people are after an income, they’re not after wealth. Most people are after active income, after something that they make more and more and more of instead of looking at how they create something that they can live from forever. And that’s really from a financial point of view, that’s the end goal, right? But even that financial goal is really in our minds, not the end. It’s a means goal. It’s a means goal because what’s behind it? It’s feelings. Today we’ll be unpacking the difference between end goals and means goals, and why your goal should be creating a feeling. What can you do to step into your end goals now? Jack: All right, Michelle. It’s time for a podcast episode again. What are we going to do today? Michelle: We’re back. Okay, so, this time around, I thought that it would be great to talk about end goals versus means goals. Jack: Back in the past. Michelle: …back in the past pursuing mean goals versus going after end goals. Jack: All right. Juicy subject. Very relevant for everyone. Let’s go and get it started. Man: Welcome to the “Forever Cash Live,” real estate investing podcast with your host Jack and Michelle Bosch. Together, let’s uncover the secrets to building true wealth through real estate and living a purpose driven life. Michelle: So, yeah. We’re back. So end versus means goals. I mentioned earlier that, you know, for a period of time there, we had been pursuing, or at least I had been pursuing mean goals. And what I mean by that is these are goals that you’re pursuing because they are a stepping stone towards an ultimate goal. So, you’re really not working on an ultimate goal, but you’re really basically spending all your energy and effort in something that you think is gonna be a stepping stone towards an ultimate goal. Jack: All right. So, means versus end goals. Exactly, so…by the way have we introduced ourselves? I think the intro did. But I’m Jack. Jack: Wonderful and this is “The Forever Cash Live” podcast. I know it was said already. By the way, if you already like it or if you already watched some, if you haven’t subscribed, yet make sure you go to jackbosch.com/podcast to subscribe, and we’ll give you a couple of other links of things towards the end of the podcast here, video. And wonderful. So, the end versus means goal. So, here’s the here’s the deal, most people, as you just said, most people in life are focusing on a means goal. Nobody really is asking, “What do I want out of life? What’s the end goal that I want? How I want, what do I want my life to look like?” And more than anything, as we said in the pre-video kind of discussion here that we had already, “How do I want to feel about that?” And Michelle’s going to cover that much more. But just on a very tactical level, most people what they do is they get up in the morning, they go to get in their car, while hopefully, they took a shower and had breakfast first, but then they go to their car, they go drive somewhere, they work for the eight to nine hours, they come back. And why do they do that? They do that in order to fulfil the means of getting an income to pay their bills, right? That’s what they’re what’s what 90% of the population does. Michelle: So, that’s one spectrum. And then there’s another spectrum. There’s like these incredible high achievers that will go ahead and accomplish everything, anything that they set their mind to. And if you are trapped in means goals, you’ll see that what happens is you’re enthusiastically going down, in my mind, the wrong path. Michelle: But even that financial goal is really in my mind, not the end. Jack: It’s a means goal. Michelle: It’s still a means goal. Jack: It’s a means goal because what’s behind it? Michelle: …and I know one of your feelings is, you know, peace of mind. So, really the financial goal is a means goal towards the end goals of peace of mind. Jack: All right. So, let’s unpack that for a little bit. So, yes. My financial, my end goal is peace of mind. So, when I say peace of mind, what I mean by that is I am, want to make sure that if I get hit by the bus tomorrow which hopefully will come what doesn’t happen, right? That my family is 100% taken care off, not on a minimal level, but on a very nice level. So, that’s kind of from a financial, if you go into the financial side of things which I often spend a lot of time in. But still, behind that goal, that we have had, and that we have built, and that we have accomplished is really a feeling of being able to sit back and say, “You know what? Whatever now happens in this world, whoever is president, whoever is mad at whom in this world, we are going to be fine financially.” That gives me a tremendous amount of financial…of peace of mind. So, that is my end goal. Now, my end goal on that therefore from that comes my thinking process then went from that point went and we had this conversation, not just mine, it’s our thinking process on that end. We’re very much aligned on that, was, “Okay. If that’s what the end goal is, then this financial abundance, this financially being taken care of needs to come without me having to actively work anymore and without her having to actively work anymore. It needs to come from a source that pays us every month no matter what we do.” And that’s where real estate comes into the play. That’s why we love real estate, and that’s when we saw finally made the shift back in 2008, ’09 from just actively, actually in 2005 already. Just from flipping land for cash. We only did at the beginning. We only did cash deals. We bought a piece of land for $2,500, sold it for $25,000, bought it for 1,800 sold it for 86,000, bought it for 10,000, sold it for 20,000. No matter what the deal was. Bought it for 400, sold it for 4,000 and so on. Starting at these things, and by the way, if you want to know more about that, you can go to landprofitgenerator.com. There’s much more information about that there. But in the meantime, coming from that, we realize that if we want to take, the moment we take the foot off the pedal, this will stop because it’s active income. It’s what we call one time cash, right? It’s just a higher quality of on time cash because instead of working at a job for a 100 bucks a day, we make $10,000 on a deal or 20. But it still is, so that became that evolution and that evolution then started us adding [inaudible 00:06:58] financing deals, and then us adding rental houses, and then us adding apartment complexes to the picture, all with the underlying goal of being able to have that peace of mind. Now, good news is we have accomplished it. We have the peace of mind now. But now it’s fun. And now, the entire world changes once you reach your end goal which is another thing we might talk about in just a second. So, go ahead. Michelle: Yeah. Well, I can already perhaps walk everyone through a little exercise. Jack: Yeah. Perhaps we wanna walk you through our kind of exercise that we went through to come to those conclusions. Michelle: Have it nicely mapped out here. Jack: And the good news, there were actually quite aligned which makes living together and being married to each other actually much easier. Michelle: Yeah, absolutely. If you do work together, you want to do these separately. You want to basically have your own, yeah, and then come together and discuss and they’re really [inaudible 00:09:29] which I guarantee you, they’re not going to be far apart, it’s going to be a different shade of the same feeling, you know, in any case. So, once we had that, the next thing we did that you could do as well is, well, why do you want to reach them, you know? What will accomplishing or having these feelings bring you? And what you’ll discover is that it’s probably more feelings, yeah? And then how will accomplishing these goals make you feel? Which I already said. And then what can you do basically every day, every month, every quarter, every year to be doing this. So, what I mean by that is how can you bring something from that seems like, you know, kind of, like, they’re floating in the air which is a feeling that you can really touch and how can you make that basically substantial and tangible and how can you bring that to the now, you know? For example, Jack gave his example of the peace of mind. Jack: How can you bring that into reality today? So if you have a goal of peace of mind, then you know that peace of mind is not being reached until, I don’t know, you have reached $200,000 in income every year, that’s passively coming in. Well, unless you’re there, you don’t therefore, by definition, have peace of mind, right? So, how can you do…and that’s kind of a sucky situation, right? You don’t want to be like maybe not having peace of mind until you someday down the road in the future accomplish that goal. So, Michelle, [inaudible 00:11:04] you wanna step into i now. Jack: Now. So, for us, every time we add another rental house, it is part of a celebration of getting more peace of mind. Because peace of mind starts if you have zero passive income. The moment you invest that in or invest in an apartment complex, or invest with…our investors, they get more and more peace of mind as they invest in our apartment complexes. They get another deal, they get another return on their safe return that comes to them. And if they have enough money placed over the years, they have also reached their full peace of mind to passive investments without even having to actively do this. So, every time is a stepping stone. You start to zero peace of mind and then you go up and up and up and so on and off you are living in a very nice peace of mind situation, if that’s one of your goals of course or whatever it is. If it’s excitement, I want to be having so much money I can do the craziest thing in the world. Well start with lazy, with small crazy things that already give you the excitement, right? That’s my point. Bring it to the future, see what [crosstalk 00:12:05]. Michelle: Bring it to the present. Jack: To the present, yeah, not to the future. Bring to the present. So, and find out what can you do today, this week, this month to already feel those things. Jack: Maybe it is placing a passive investment, maybe it’s getting that first rental property from the profits of your land flipping or whichever it is, you work towards those goals that give you the feeling that you’re really after. So, we have put together a little process where you ask yourself those questions, and can you repeat them one more time? Michelle: So, what are your five, you know, ultimate goals or end goals? Why do you want to reach them, you know, or what will accomplishing them give you? How will accomplishing these goals make you feel? And then what can you do every day, every month, and every quarter basically to step into those end goals today, now? Jack: And rock and roll and anything like to basically to get distracted from where they are and how in a sense unhappy they are. And then when you meet them, they’re like, “Everything is awesome,” but that’s just the surface. It’s really often, so often not true. So, figure out what it is really want, that you want, what is your end goal in life, how does that look like? And then map out the plan towards that, what do you need to learn, what you need to master? And then also on that, as Michelle said, how would that make you feel to be in this, to live that life? And then that’s the feeling that you’re ultimately after and then make sure you try to implement little things that make you feel like that as often as you can. And what you’ll find is every time, and almost condition yourself to equate certain things that you do with that feeling which also helps you propel yourself forward faster, right? So, you almost like condition yourself that a deal that you made $5,000 on brings you towards your end goal even though if it’s a cash deal because you’re going to take $1,000 and put it off to the side, or take 20%, 30% put it off to the side and reinvest the other one. And it’s not just, “I made $5,000, that’s okay. Other people who made $250,000.” And it’s not stepping into the discontent about comparing yourself to others, it’s stepping into, “This is my goal. This is the thing. And every little thing that I do to work that, I can celebrate as I step towards that and I can step into that feeling in that moment.” Does that make sense? Jack: All right. So, again, thank you very much for listening to this and watching this podcast, and whether it’s watching on video, listening to it on audio, if you saw it on YouTube, if you perhaps posted it on Facebook, I don’t know, wherever you see us, make sure you go and comment below it. There’s a comment field almost everywhere, at least on YouTube and Facebook there is. Ask us questions, engage with us, we will happy to answer your questions about that. We want to get in discussions start of the about that. What do you think about this, what’s your number one take away from this podcast? Put that below here. And then also, I would love if you go over to iTunes and give us a five-star review. And also, again, I already mentioned that you can go to landprofitgenerator.com to learn more about this entire land flipping thing that got us started in an easy and effortless way, which is the subject of the last podcast. All right. Thank you very much. Man: Enjoyed this episode? Then make sure you like, subscribe and post your comments and questions below the video. We’re looking forward to hearing from you.